We have the Best Rates on Party Buses in Toledo. Our prices cannot be beat! Here at Extreme Class Limousines, we recognize and know what you are looking for from Toledo limo services and car services. Extreme Class goes farther than any of the other limousine companies or Black Car Services in NW Ohio, providing you professional service with a personal touch. 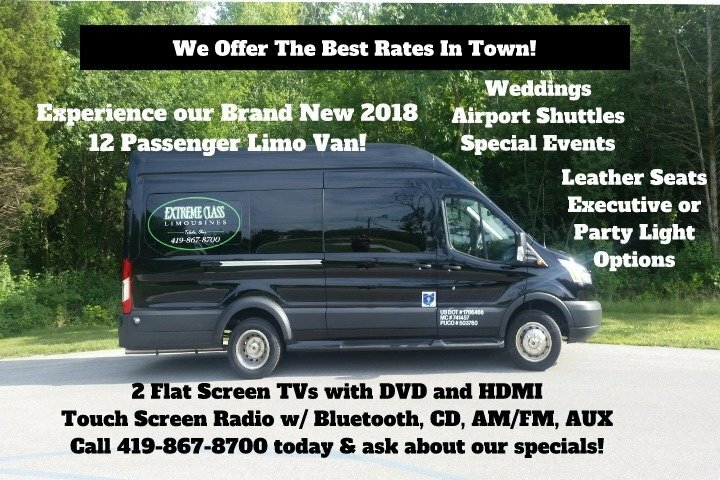 With clean, comfortable vehicles and friendly, professionally trained drivers, Extreme Class Limousines offers a first class experience at an affordable cost. Contact Toledo's most reliable limousine service for on time service & make your reservation today! We want you to get the most that you can out of your experience with us by offering several personalized packages for not only weddings, but also for special occasions, sports outings, corporate dining, team building exercises, proms, graduations or event just a night on the town. Don't forget to check out the contests, special offers and discounts page! We are always updating it with new ways to save or win our services! Although we specialize in these reservations, please contact us for any other event requests you have. We are always excited to decorate our vehicles and participate with any unique or themed event requests. Let us take the stress out of transportation for your event. Offering 10 - 18 Passenger limo options, all with six foot tall ceilings! Our Party Buses provide not only safe, reliable transportation for your group, but also a fun, luxurious atmosphere. Extreme Class Limo has been offering reliable airport shuttles to all Major Airports in the region for over ten years. We also specialize in corporate and international airport shuttles and travel. We offer the most reliable Corporate Airport Shuttles, but also, our limousines and party buses are great transportation for team building exercises, company events and hoiday parties. Don't let this be you on your special day! Check out all of our wedding shuttle options. We offer both guest shuttles and wedding party transportation. Make sure no one misses your day! Whatever you plans are Extreme Class Limo has a vehicle to meet your needs. Our Party Buses are great for tailgating sporting events. Rent a Limo for seasonal events like Holiday light tours or summer Put-In-Bay Shuttles. Extreme Class Limo even has Sedans for a quiet night at Stranahan Theater. So leave the stress of driving to us! Whether you wish to go down the street or across the country, Extreme Class Limousines wants to get you there on time and safely. We are eager to ensure that everything is done to your satisfaction. Some people forget to think about a party bus or limousine company when booking transportation from places like airports, hotels, or meetings, but we have a vehicle that will meet your needs and budget. Extreme Class Limousines is dedicated to encompassing all of your transportation needs. We do not just drive to and from airports and hotels, use us for fun seasonal events as well. 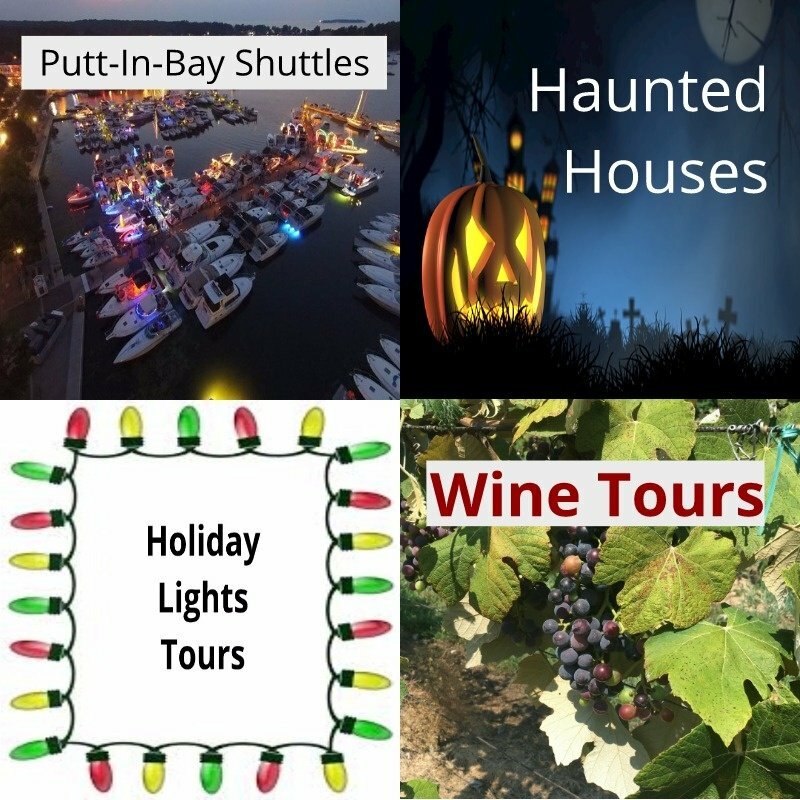 Put-In-Bay Day trip shuttles, Wine Tours, Haunted Houses and Holiday Lights Tours are just a few ideas we can suggest. You or your pets afraid to fly? Extreme Class Limousine has you covered! Sit back, relax, and let us drive you anywhere in the United States. Seasonal Resident? Let us help you make the transition between Toledo and your "Home away from Home." We assist with transporting not just you, but are available for also your car, or your pets, to get them to your Winter home in a warmer climate.